In this experiment, the objectives of this experiment was to understand the diverse applications of gold nanoparticles and to synthersize Colloidal gold nanoparticles by “liquid chemical method”. 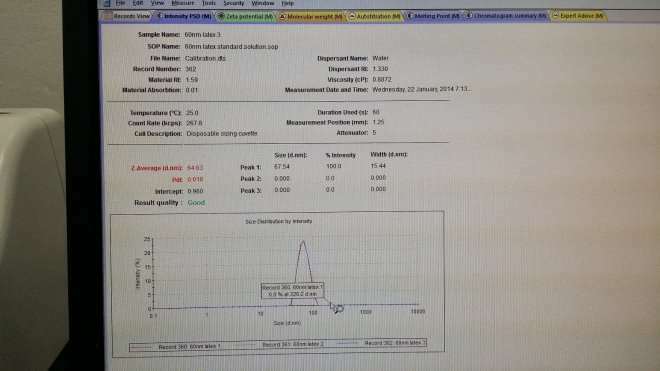 Z-average of nanoparticles for the reddish solution and the greyish solution was 60.86 and 50.40 respectively. 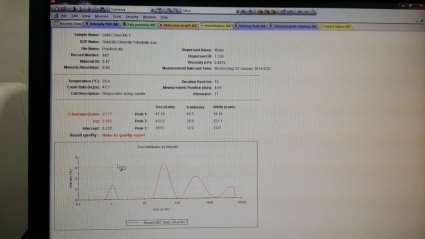 However it was noted that there were impurities in the solution hence affecting the Z-average. As such, the colour of the solution and the Z-average did not tally. It was discovered that by adding salt into the solutions there will be colour change. This is due to NaCl aggregating the nanoparticles together. This causes the nanoparticles to absorb the red light hence reflecting the solution in a more blue colour. Other methods of forming gold nanoparticles and a diverse application for gold nanoparticles were noted. The objectives of this experiment was to understand the diverse applications of gold nanoparticles. Colloidal gold nanoparticles were synthesized by means of “liquid chemical method”. Most of the gold nanoparticles are produced in a liquid (“liquid chemical methods”) byreduction of hydrogen tetrachloroautate (H[AuCl4]). By dissolving H[AuCl4], the solution is rapidly stirred while a reducing agent is being added. This causes Au3+ ions to be reduced to neutral goldatoms. As more and more of these gold atoms form, the solution becomes supersaturated, and gold gradually starts toprecipitatein the form of sub-nanometer particles. The rest of the gold atoms that form stick to the existing particles, and, if the solution is stirred vigorously enough, the particles will be fairly uniform in size showing the solution as red.To prevent the particles from aggregating, some sort of stabilizing agent that sticks to the nanoparticle surface is usually added. Also, gold colloids can be synthesized without stabilizers bylaser ablationsin liquids. They can be functionalized with various organic ligands to create organic-inorganic hybrids with advanced functionality. Several methods that revolve around this idea are Turkevich method, brust method and perrault method, etc. Colloidal goldis a suspension particles ofgoldin a fluid, usually water. The liquid is usually either an intense red colour (for particles less than 100nm) or blue/purple (for larger particles). As particle size increases, the wavelength of surface plasmon resonance related absorption shifts to longer, redder wavelengths. 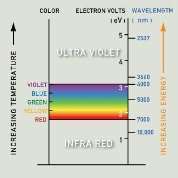 Red light is then absorbed, and blue light is reflected, yielding solutions with a pale blue or purple color. A change in temperature will also affect which the gold to be at a different energy band. The diameter of gold nanoparticles determines the Wavelength of light absorbed as shown on the diagram illustrated above. 0.1g of H[AuCl4] was dissolved in 500ml distilled water to obtain 1.0mM hydrogen tetrachloroautate. 0.5g of Na3C6H5O7.2H2O (trisodium citrate dehydrate) was dissolved in 50ml of distilled water to obtain 1% concentration. 0.5g of NaCl was dissolved in 10ml of distilled water. 20ml of 1.0mM H[AuCl4] was added to a conical flask. The conical flask was placed in a stirring hot plate and a magnetic stir bar was added. 2 samples were prepared. One was stirred continuously even it was at boiling point. The other sample stopped stirring once it was boiled. 2ml of 1% solution of trisodium citrate dehydrate was then added to the boiling solution. Gold Sol was gradually formed as citrate reduces the gold (III). Presence of a colloidal suspension was observed by the reflection of a laser beam from the particles. The solution of both samples were being transferred to two test tubes. 5 – 10 drops of 1M NaCl solution was added into one of the test tubes and the color change of the solution was being observed. The two solutions in the test tubes were being filtered with a 0.45 um syringe filter. The solutions were subsequently transferred into a sample holder. 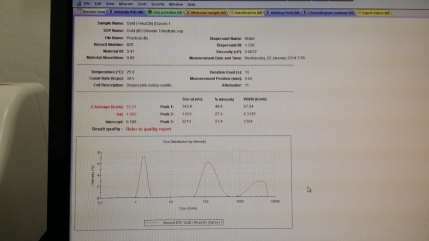 From the results, Z average for the reddish brown solution was calculated at 60.86nm, while the greyish/blue was calculated at 50.40nm. With reference to theory, the results concluded by Z-average is inaccurate. By right, anything at the blue shift is of a larger particle size. By reading off the highest intensity peaks of both graphs of red and blue solutions, size of particles were 41.1nm and 143.9nm respectively. Ideally 1 peak in the chart would be best. Other peaks that affected the Z-average were probably impurities. This error may be due to carelessness of assuming all equipments provided for the experiment were clean. Hence there could be dirt or dust trapped whatsoever. In order to obtain even smaller particle sizes, adding of all solutions should have been done slowly, for example adding trisodium citrate drop by drop, allowing the droplet to fully react with the solution before adding in another. With that, the mixing part is no doubt the most crucial process parameter of the experiment. Other factors that affect particle sizes are mixing time and temperature and concentration. Different temperatures within the reaction will cause heat and mass transfer gradients. A low concentration of solution will yield too low of a result and lastly for our case, mixing time. Insufficient mixing time/stoppage of mixing will disallow the nanoparticles to disperse. Hence having a larger particle size. 1. Explain the functions of trisodium citrate used in this experiment. In this experiment, Trisodium citrate acts as an reducing agent to reduce hydrogen tetrachloroautate in order to produce spheroidal gold paticles. In general, the greater the concentration and power of the reducing agent. The smaller the resultant gold particles in the suspension. In step 4.6 of the practical booklet, NaCl solution is added into the solution causing a colour change. By adding NaCl into the solution, it causes the gold nanoparticle surface charge to turn neutral, causing the nanoparticle to aggregate. As a result the solution colour changes from red to black – blue. As for the greyish – bluish solution, it turns to a even clearer solution. A larger particle size will cause absorption of the red light hence reflecting the solution as blue. 3. State two other synthesis methods for gold nanoparticles beside the “liquid chemical” method. One method for the experimental generation of gold particles is by sonolysis. The process is based on ultrasound. It uses the reaction of an aqueous solution of HAuCl4withglucose. The reducing agentsare hydroxyl radicals and sugar pyrolysis radicals. The morphology obtained is that of nanoribbons with width 30–50nm and length of several micrometers. These ribbons are very flexible and can bend with angles larger than 90°. When glucose is being replaced by cyclodetrin (a glucose oligomer), only spherical gold particles are obtained. Other method for gold nanoparticles is by using a block copolymer.In this synthesis methodology, block copolymer plays the dual role of a reducing agent as well as a stabilizing agent. and further reduction of gold salt ions on the surfaces of these gold clusters for the growth of gold particles in steps. This method usually has a limited-yield (nanoparticle concentration), which does not increase with the increase in the gold salt concentration. Recently a test has been done that by adding trisodium citrate in 1:1 molar ratio increases the gold formation by many gold. 4. Cite some other application in addition to those mentioned under “introduction”. Electronics – Gold nanoparticles are designed for use as conductors from printable inks to electronic chips. As the world of electronics become smaller, nanoparticles are important components in the chip design. Nanoscale gold nanoparticles are being used to connect resistors, conductors, and other elements of an electronic chip. Probe – Gold nanoparticles are relatively dense, making them useful as probes for transmission electron microscopy. Catalyst – Gold nanoparticles are used as catalysts in a number of chemical reactions. The surface of a gold nanoparticle can be used for selective oxidation or in certain cases the surface can reduce a reaction (nitrogen oxides). Gold nanoparticles are being developed for fuel cell applications. These technologies would be useful in the automotive and display industry. In conclusion, the experiment was not very successful as there were impurities in the solution. Hence the Z average was being affected. However objectives were met as colloidal gold was being synthesized and applications of gold particles were also understood. "Determination of Gold Nanoparticle Sizes." UKEssays.com. 11 2018. All Answers Ltd. 04 2019 <https://www.ukessays.com/essays/sciences/determination-gold-nanoparticle-sizes-5217.php?vref=1>. "Determination of Gold Nanoparticle Sizes." All Answers Ltd. ukessays.com, November 2018. Web. 22 April 2019. <https://www.ukessays.com/essays/sciences/determination-gold-nanoparticle-sizes-5217.php?vref=1>. UKEssays. November 2018. Determination of Gold Nanoparticle Sizes. [online]. Available from: https://www.ukessays.com/essays/sciences/determination-gold-nanoparticle-sizes-5217.php?vref=1 [Accessed 22 April 2019]. UKEssays. 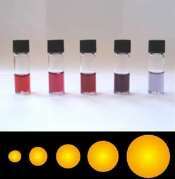 Determination of Gold Nanoparticle Sizes [Internet]. November 2018. [Accessed 22 April 2019]; Available from: https://www.ukessays.com/essays/sciences/determination-gold-nanoparticle-sizes-5217.php?vref=1.